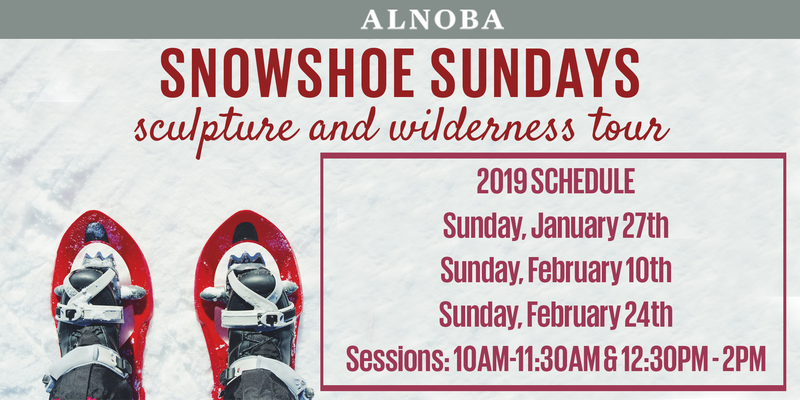 Get out of the house this winter and head over to Alnoba for Snowshoe Sundays! Snowshoe your way through one of New England’s largest outdoor sculpture parks of international artists, ranging from John Lopez, Andy Goldsworthy, to Beezy Bailey! This event is for all levels, it’s fun, and great for families, beginners, or experts! Cost includes snowshoe instruction, guided art and nature tour of Alnoba, and celebratory bonfire! All tours are weather permitting and subject to cancellation. There are three scheduled snowshoe tours, and each day will be different, so be sure to check them all out! Take a sneak peak at some of the sculptures HERE. What if there’s no snow? Alnoba will determine if tours are to be cancelled, and registered participants will be notified via e-mail by 12 noon on the Friday before the scheduled date. If there is no snow on the scheduled date, you may transfer to another date or request a refund. What is the refund policy? No refunds will be given for snowshoe tours unless Alnoba cancels. This policy is strictly enforced. What should I wear? A good pair of insulated, mid-height, laced hiking boots, long sleeves, crew neck or turtleneck, warm jacket, waterproof/breathable wind pants, heavy wool or synthetic socks, warm gloves, warm hat, sunglasses. Will there be restrooms? Yes, there will be portable restrooms available in the main parking lot. Will there be food at the event? There will not be food served at the event, however our friends at The Farm at Eastman’s Corner will be open from 8AM – 7PM with farm prepared meals, snacks and drinks to keep you warm! Alnoba is not responsible for any accidents, injuries incurred or lost items.